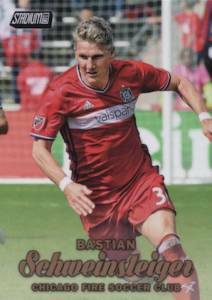 The TSC brand enters the world of Major League Soccer with 2017 Topps Stadium Club MLS. 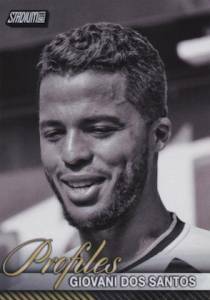 Focusing on impressive photography, hobby boxes also deliver a pair of autograph cards. Promising cards with "the emotion and intensity of Major League Soccer like never before," the base set takes a detailed look at the domestic league. Among the parallel options are First Day Issue, Gold, Black & White and hobby-exclusive Members Only editions. In addition, short-printed Variations swap the photos for select base subjects. Zeroing in more on the top stars, 2017 Topps Stadium Club MLS also includes the up-close Profiles insert. 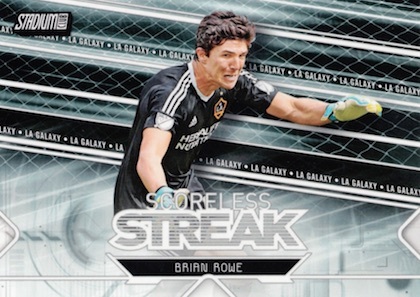 Meanwhile, action images are used for Scoreless Streak, which showcases the best goalkeepers. 2017 Topps Stadium Club MLS also has a variety of signed cards that combine to offer two per hobby box. The Base Autograph set naturally applies a signature to the main design, and adds limited parallels. Dropping two per case are the more limited Lone Star Signatures inserts that display two images of each soccer player included. 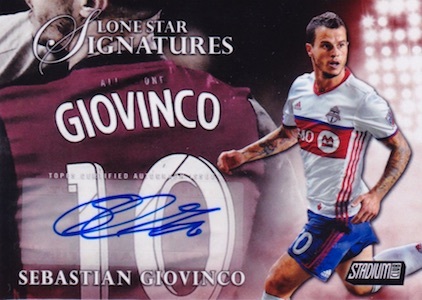 Doubling up the signers, the Co-Signers Autographs set brings the multi-player insert line to MLS. PARALLEL CARDS: Black & White, Gold, First Day Issue #/10, Members Only #/6 (Hobby), Sepia 1/1. 20 cards. 1:19 packs. Code ends in #557. 44 cards. 1:16 packs. Shop on eBay. PARALLEL CARDS: Black & White #/99, Members Only #/20, First Day Issue 1/1. 21 cards. Hobby only. 1:120 packs. 20 cards. 1:4 packs. Shop on eBay. PARALLEL CARDS: Members Only #/25, Sepia 1/1. 10 cards. 1:8 packs. Shop on eBay. Good: Nice photography; base set build is not too challenging; black and white parallels are solid. Bad: Design feels like Stadium Club light; just two main inserts; sticker signatures. 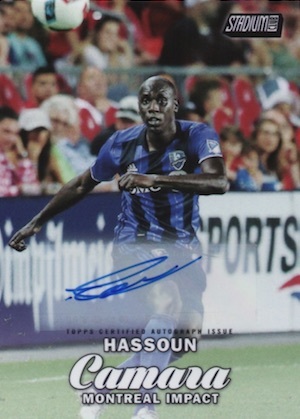 The Bottom Line: Although not the strongest debut, 2017 Topps Stadium Club MLS does bring a new choice for collectors that is worth a look if you are an MLS fan. It does seem like Topps went bare bones here, weakening the appeal a bit, but there are still some decent pieces to work with. For me, I have a certain expectation from Stadium Club. The first is rich-color, full-bleed images. Stadium Club MLS has this and it helps carry the set. Another is great photos. It can be hit or miss, but I did see some impressive photography in the base set. I wouldn’t call the standard Stadium Club design low-end, but it is the right mix of basic and refined. This is an area where 2017 Topps Stadium Club MLS comes up short. Yes, the main design matches the baseball set from this year, but missing a key element. 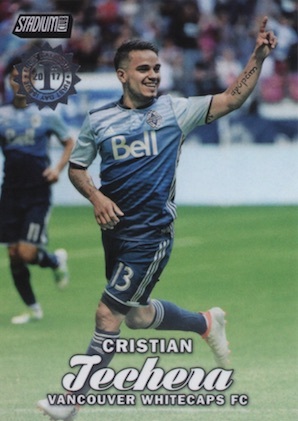 Whereas MLB cards carry foil for the logo, player name and team name, MLS goes without. In my opinion, this greatly cheapens the design. They at least kept some foil for the Members Only and First Day Issue parallels, which look nice. And I thought the black and white parallels made for a good contrast. I also noticed that cards with serial numbering are printed with black ink instead of being foil stamped. Not a huge issue but a noticeable downgrade for me. A bigger problem is the lack of on-card autographs. This arguably makes the set for baseball, but stickers are the path taken for MLS. Given the reputation of the brand, I did expect a little more from the inserts. Profiles is naturally all close-ups, and Scoreless Streak is a carryover from baseball, but for the keepers this time. That’s it. What I see is a lot of things removed but nothing added, and it is a little disappointing. 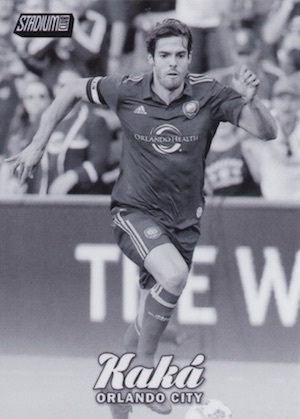 The 2017 Topps Stadium Club MLS checklist is a bit more minimal, but that is easier for the set collectors. The 100-card base set adds 20 SP variations, and several signed sets. Unfortunately, other than Jordan Morris, Pirlo, Giovinco, and a few of the USMNT players, most of the main autographs are on the weaker side. Even at the $40-50 range that hobby boxes are currently priced, value is not great for 2017 Topps Stadium Club MLS. They simply removed too much of what makes the baseball set work and the price did not drop enough to match that. Without hitting a low-numbered parallel or autograph, the value will have to come from the enjoyment of the images for most collectors. I was excited about 2017 Topps Stadium Club MLS and really wanted it to be amazing. Perhaps that hurt my experience more. It just felt too depleted and it’s hard to understand that if you don't see added value somewhere else. By no means was it terrible, it just didn’t deliver what I was expecting. The good thing is that clear fixes can turn it around quickly. Topps just needs to apply the same elements from the baseball version, and that alleviates most of the issues. This was my first soccer set and I have to say that the photos are just STUNNING. Guarunteed auto in blaster was what got me hooked and then I absolutely had to buy a hobby box to fill out the base set. Profiles are always kinda goofy to me, reminds me of the Topps Bunt 2017 “perspectives” cards where the player is just kinda “staring” off into the distance. Also like to remind that these are sticker autos which is a downside for some people but I don’t mind personally. 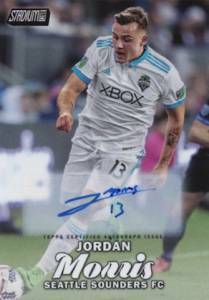 2017 TOPPS STADIUM CLUB MLS SOCCER HOBBY BOX - 2 AUTOGRAPHS! 2017 TOPPS STADIUM CLUB MLS SOCCER HOBBY BOX LOT OF 3 - 6 GUARANTEED AUTOS!